Egypt’s naval forces launched four ground-to-sea and surface-to-sea rockets in the Mediterranean Sea on Tuesday, continuing the comprehensive security operation dubbed Sinai 2018 that began Friday. 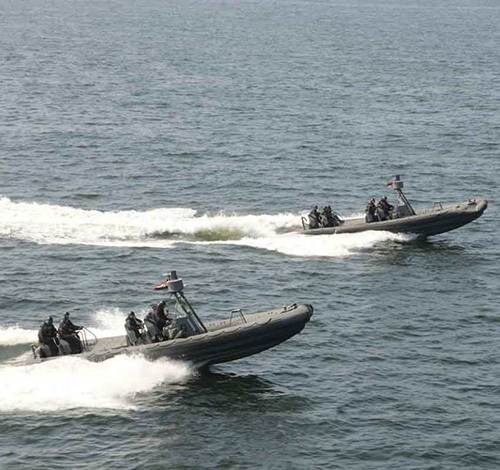 These naval drills are deemed a strategic message to address potential threats to Egypt’s regional waters. On the fifth consecutive day of the full-scale security operation, the naval forces continue to tighten their grip along the coastal area, according to the armed forces’ statement no. 6 released on Tuesday. “The Sinai 2018 operation carries various strategic dimensions… The Egyptian naval forces’ drills prove our sophisticated readiness that our forces are enjoying,” Omda told Egypt Today on Tuesday. He added that Egypt’s economic interests in regional waters are completely secured, revealing that Egyptian military deals have been concluded according to potential threats and aggressions expected to occur in the near and far future. “The launching four rockets has given a strong message that Egypt will not hesitate to use live ammunition against violations that may threaten Egypt’s sovereignty, land, airspace and waters,” Major General Hisham al-Halaby told Egypt Today. “As part of the comprehensive Operation Sinai 2018 carried out by elements of the armed forces, in cooperation with the combat units of the Interior Ministry, anti-terror units continue launching raids targeting terrorist hideouts and arms and ammunition warehouses in North and Central Sinai,” the statement read. On the fourth consecutive day of Sinai 2018, the Egyptian military and security forces destroyed 30 hideouts used by militants to carry out their attacks against military and police personnel as well as civilians, destroyed 60 targets, killed 12 terrorists following exchange of fire, arrested 92 criminals and seized 20 vehicles that terrorists used in carrying out terror acts, according to the fifth statement released by the Egyptian armed forces on Monday. Egypt launched the large-scale security operation early Friday morning, involving land, sea and air forces, in various areas across Egypt, including North Sinai, the Western Desert and the Nile Delta region. “The comprehensive security operation Sinai 2018 is targeting terrorist and criminal elements and organizations,” said army spokesman Col. Tamer el-Refai in a televised statement on Friday. Egypt’s President Abdel Fatah al-Sisi authorized the Army Chief-of-Staff to use “all brute force” against terrorism, and he gave security forces a three-month deadline to restore stability to North Sinai. On February 5, Turkish Foreign Minister Mouloud Jawish Oglu said in an interview with Greek newspaper Kathimerini that Turkey does not recognize the 2013 Maritime Demarcation Agreement to demarcate the maritime boarder between Egypt and Cyprus to benefit from natural resources in the eastern Mediterranean Sea. Egypt’s Foreign Ministry replied that any attempt to harm Egypt’s sovereignty is rejected and will be addressed, and no party can dispute the legality of the Maritime Demarcation Agreement between Egypt and Cyprus. To avoid such conflicts in the Mediterranean region, Egypt has sought to hold negotiations with Cyprus and Greece over maritime borders, and to promote Egyptian relations with Cyprus and Greece as Turkey and Israel attempt to take control of gas wells in the Mediterranean. Consequently, one of the bilateral agreements signed between Egypt and Cyprus was the 2003 Delimitation of Maritime Borders Agreement, followed by the 2006 framework agreement. Also, in 2012, a cooperation agreement between the two countries was signed to explore for gas in the Mediterranean on the Egyptian-Cypriot borders, as the region is rich in natural gas.